Plasmas are gases of charged particles. Plasmas are by far the most common phase of ordinary matter in the universe, both by mass and by volume. Stars (including our Sun), interstellar and intergalactic space are all plasma. Closer to Earth, the magnetosphere, aurora, and lightning are natural plasmas. Industrial applications include lighting and materials processing, especially processing of semiconductors. Potential applications include compact particle accelerators and controlled fusion energy. Faculty at UC Irvine are engaged in all of these areas: natural plasmas, industrial applications, plasma accelerators, and magnetically confined fusion energy. 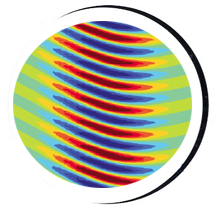 Gyrokinetic theory and massively parallel particle-in-cell simulations of fusion and space plasmas, with relevance to ITER & magnetic confinement. Theoretical research on turbulence, transport, and zonal flow dynamics; non-linear plasma phenomena and non-linear wave dynamics. Studies of laser wakefield acceleration of electrons and ions, high-field science, atto-second coherent x-rays, photo-nuclear physics, photo-medical physics, laser Compton γ-rays, low-dose high-contrast x-ray imaging, Auger electron cancer therapy. Energetic ions in magnetic fusion devices. Field reversed configurations for fusion energy. Experimental characterization and simulation of microsecond, micron-scale plasmas.